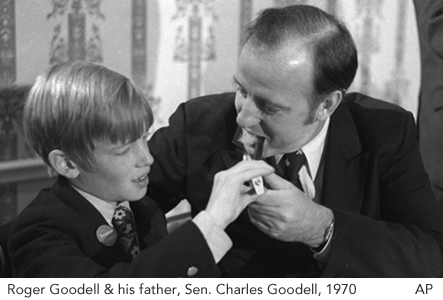 Goodell’s father, Charles Goodell, was an attorney and a member of the House of Representatives when in 1968 he was chosen by NY Governor Nelson Rockefeller to fill the U.S. Senate seat left vacant by Sen. Robert F. Kennedy’s assassination. Six years later, Nelson Rockefeller was chosen to fill the vacant seat of U.S. Vice-President under replacement President Gerald Ford. And then, only eighteen years later, Nelson Rockefeller’s grand nephew John Davison Rockefeller V married Emily Tagliabue, one of Paul and Chan Tagliabue’s twin daughters. Coincidence? Yeah, probably.